Between the two of them, and around the turn of the century, Spacey & Bridges put together quite the filmography. The Big Lebowski, American Beauty, Arlington Road, Pay It Forward, Seabiscuit, The Life of David Gale; some pretty solid stuff in there, and that’s just within the span of a few years. These two actors are among the best in the business, or at least were, Spacey moving over to TV & Bridges not currently making the best film choices. But the point remains the same; you’re lucky to watch a movie in which they both star, especially back in their prime. 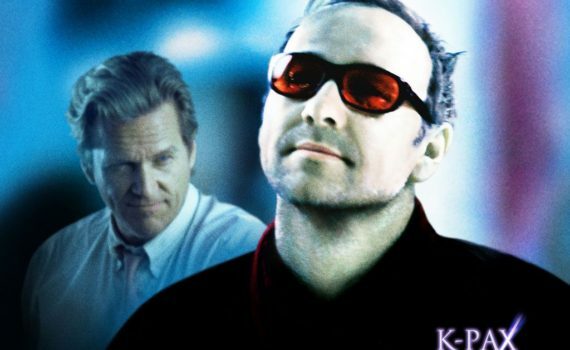 K-PAX is a unique story, a feel-good film in a very twisted way, but still shows off some excellent acting talent from its leads and still gets me every time I watch it. Dr. Mark Powell is a psychologist whose newest patient is among the oddest he has ever encountered. Calling himself Prot (pronounced PrOHt, not PrAHt), this man claims to be from another planet. Not an uncommon delusion perhaps, but Prot’s insistence on the existence of K-PAX, his home planet, and his ability to back up his claims has a dozen professionals baffled. Powell thinks that Prot is burying some sort of trauma deep down, deeper than even the man himself can reach, causing a complete break from reality. But Prot knows planetary information no one on Earth can know, speaks with dogs, appeared in the city out of thin air, and is beginning to convince the other patients that he will take one of them into space when he returns, on a date in late July. Powell feels convinced that he must help Prot before that day comes, at the risk of disastrous repercussions. Judging the best of Spacey’s career, there are a ton of films to choose from, but one of my favorites will always be his performance in K-PAX. It’s just so simple and yet so convincing, a brilliant portrayal of a troubled man that leaves you second guessing your decision throughout the movie; is Prot crazy or is he really an alien? In that confusion we are lock-stepped with Dr. Powell, played wonderfully by Jeff Bridges, unsure what is real, what is illusion, up to the final scene. Both actors bring their A+ game, and to see them acting together is a real treat. The movie itself is very late 90s, has a great feel, some cool side characters, and never gets boring. I own this movie, but need to pull it out more often; it’s worth it.